The fundamental capability common to all of the standards above is that you must be able to prove both that the testing done has satisfied a particular requirement and that the test process is viable and comprehensive enough to establish proof. Most silicon projects have tens to hundreds of requirements, which are represented by thousands of sub-features and functions that must be exercised together to accommodate the requirement(s). Each sub-feature and function is functionally tested and hundreds of functional coverage metrics are used to collect results of each test. While some of the requirements are safety related and need additional testing for safety integrity, this process of test definition, to feature/function decomposition, to exercising the critical aspects, and finally to results collection, is a well-documented and codified process, implemented by hundreds of Cadence® customers. The only proven way to automate this process is to use a verification planning and management solution, which can manage the complex verification flow including the functional interdependencies and the many-to-many mapping techniques necessary. A requirements management flow is nothing more than a few enhancements on top of a proven functional testing process, something the Cadence Incisive® verification platform has been doing for years. The key aspect that Cadence brings is a planning technology explicitly designed for this kind of work. The highest level of the requirements management flow can be seen in Figure 1. The diagram shows an outer loop of requirements managed by the vManager Metric-Driven Signoff Platform and an inner loop run by the Incisive Enterprise Simulator that exhaustively exercises those requirements and returns test results. As with most hardware or software development, no matter how simple the diagram appears, the challenge is in the application and automation of the flow, and ensuring integrity of the testing process and roll-up of results. In addition, because most developments are iterative, a well-defined change management process is needed to ensure the development process can operate smoothly. 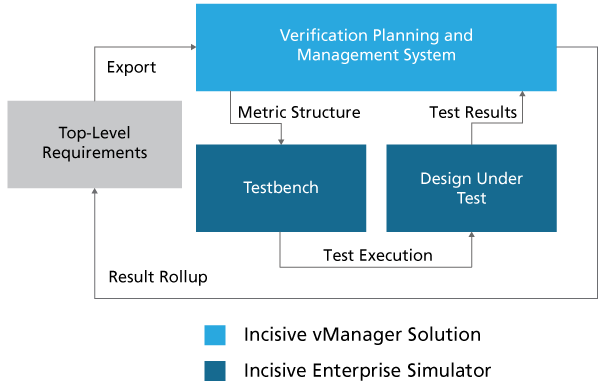 The Incisive requirements management flow is based on the advanced planning capabilities of the vManager Metric-Driven Signoff Platform, which ensures the traceability, testing, management, and execution on various engines (primarily RTL simulation but also software simulation), and the implementation of functional coverage that gets executed within the Incisive platform. The Incisive solution has been used in production in various industries, including automotive, aviation, medical, and industrial. It was also the planning and management solution utilized for the world’s first ISO 26262-certified chip. Planning: Electronically link top-level requirements to features—either safety or non-safety based. For each of the key features, you plan how to execute tests for those features and link them together into a comprehensive and executable verification plan (vPlan). The vPlan technology is a living representation of all features and sub-functions, with back-annotated test results. Test traceability: The verification plan supports all leaf-level details from requirements, to features, to functions, to the coverage elements and metrics. When tests execute, coverage results are populated to each mapped area within their source hierarchy for easier management. A resultant vPlan is the implementation traceability matrix, and is correct by construction, but also serves as the roll-up mechanism for reporting. Coverage: Functional coverage is the only metric that pertains to a requirements management flow. Functional metrics can be driven by cover groups or by assertions defined in the testbench, in either hardware or software. Users have a choice of SystemVerilog, Incisive Enterprise Specman Elite, e, PSL, or SVA assertions to define the testbench that drives the test process. Specification annotation: The design and/or requirements specification can be connected to the executable verification plan to ensure test case coverage (each requirement is satisfied by at least one test), and for the purposes of specification traceability and change management. Change management: Each section of the verification plan enables specification sections to also be linked, such that any change in requirement, specification, or missing tests can be automatically flagged for user correction.